The Cochise Conservation and Recharge Network consists of seven sites as of 2018, plus potential projects, on a total of 6,344 acres along the Upper San Pedro River, as shown on the CCRN Site Location Map. 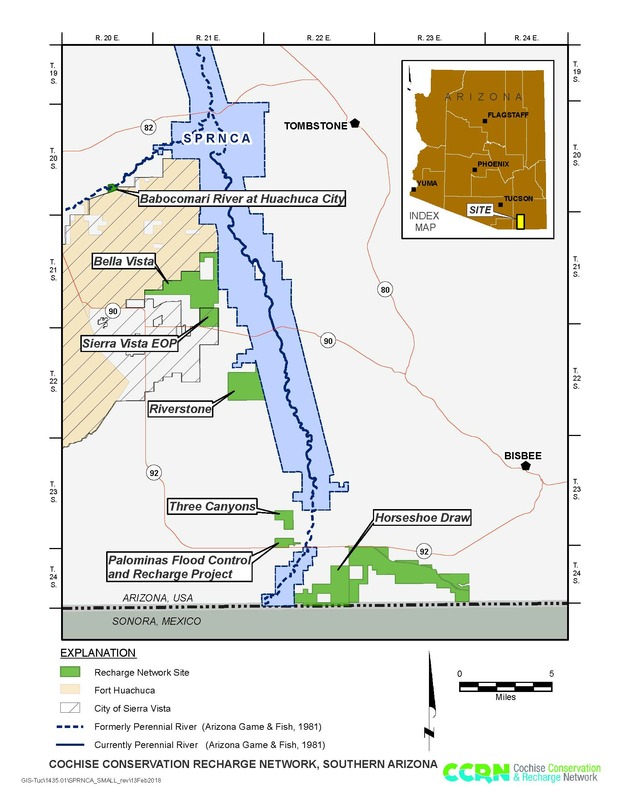 Listed from upstream to downstream (south to north), the projects are Horseshoe Draw, Palominas, Three Canyons, Riverstone, Sierra Vista Environmental Operations Park (EOP), Bella Vista, and Babocomari River at Huachuca City. Each site has been selected for its potential to recharge and/or conserve water to benefit the river. The sites offer diverse but complementary hydrologic functions at a regional scale. These functions include the ability to retire historic high-volume pumping, and/or to preclude high-volume future pumping near the alluvial aquifer, and to recharge effluent, urban enhanced runoff (UER) and/or diffuse stormwater in key locations. Additional sites that are capable of enhancing the vision of the CCRN may also complement this network and be promoted by the CCRN in the future.